Topping is a central and fundamental plant training practice. It enables you to train your plants to grow horizontally and make the most efficient use of the light. In this article we explain the science of apical dominance and the reasons why you should top cannabis plants. We provide simple instructions for when to top cannabis plants to avoid stunting and get the best results. Topping is actually rather simple and any grower can master it. We offer useful advice for how to top cannabis plants. Topping is a “high-stress” training technique which entails removing the top growth tip from the main stem or a branch. Many growers are concerned that cutting the top off their young plants may slow their grow down, however, when done properly, topping is a critical method to fill the canopy faster and reduce vegetation times. Cannabis plants typically grow tall and skinny, much like a Christmas tree. 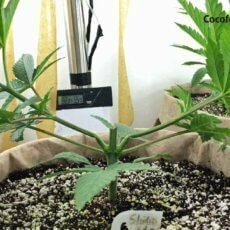 Without training, they have minimal lateral growth and concentrate most of their resources in one stem with one main cola. They display a phenomenon called “apical dominance”, which is the key factor that determines the directional growing characteristics of plants. Different types of apical dominance lead different plants to produce their patterns of both vertical and horizontal growth. This programming in plants is an evolutionary adaptation to their typical growing environments. The landrace varieties that are the source of modern cannabis genetics are typically tall fast-growing annuals that are in competition with other plants for canopy space. Thus, they grow in a shape that is effective for that environment. However, we are not growing them in that environment! There are other plants that grow flat and broad because they are adapted for environments where light is scarce. These plants serve as a better model for us to think about when trying to make the most effective use of overhead light. Ideally, we want low broad plants that harvest every photon of light energy available to them. Cannabis naturally grows like a Christmas Tree because its apical dominance is set for tall skinny growth. It is possible to achieve some degree of lateral growth dominance with nothing but low-stress training (LST), but the single most effective way to break the apical dominance in cannabis is to cut off the apex, by topping the plant. The top or end shoot, which is the main growing point in plants, contains the hormones which control the functions for apical dominance. Auxins, are one hormone that appears to play a particularly significant role. The apical growth tip produces auxins, and they are transported through the phloem, always downward, where they inhibit the growth of lateral growth tips lower on the plant. The auxins prevent elongation of the growth-tips below the apex, however, they don’t travel long distances through the plant. Therefore, as the plant gets taller, the lowest branches become freed from the inhibiting effects of the auxins and begin developing. This produces the classic “Christmas tree” shape. Topping allows us to manipulate the growth patterns of the plant by removing top apical growth tips where auxins are produced. This is called, “breaking the apical dominance”, and it allows lateral branches to develop. Many plant training practices such as manifolding and mainlining, rely on topping as a component technique. However, it can also be used on its own to break apical dominance and train cannabis plants. We generally recommend that you wait until your cannabis plants have 6 nodes before topping them. This ensures that they get adequate stem and root development before the shock of topping. Because of the nature of how auxins behave and what is most efficient for light, we recommend topping the plant above the 4th, 5th or 6th node. Topping higher than the 6th node, can lead to uneven dominance and a pattern that prioritizes vertical growth. Manifolds and Mainlines are often topped down to the third node, but if you are not following those training practices, topping below the fourth node will leave too few branches to develop. When the plant has reached the 6th or 7th node, it is ready to be topped. Choose a node to “top to”. If you “top to” the fourth node that means that you leave the fourth node and all the branches below that. We recommend topping to the 4th, 5th, or 6th, node. When you top the plants, you are completely removing the upper growth. No new growth will develop from the growth tip that has been cut. This allows the lower lateral growth to assume the dominance. Since there are two growth tips at each node, you effectively double the number of dominant growth tips every time that you top the plant. You may top the plant to the 6th node as the seventh node is emerging by carefully removing the growth tip just above where two new shoots are forming. If you top lower than the 6th, you are going to be cutting away a significant portion of the upper growth on a plant (see pictures). This is the aspect that can be hard for new growers to accept. We nurture our little seedlings and then we chop off their heads! The actual act of topping is incredibly simple. 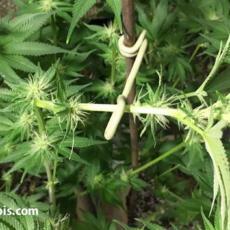 Take a pair of pruning snips and snip off the growth tip. To further reduce the possibility of infection, we recommend that you sterilize your snips before using them to top. This can be done with heat (boiling water or open flame), but let the snips cool again before use. We recommend topping high on the stem, rather than just above the node. This section of “stump” will help the plant recover from the injury and it mitigates the risks of stem splitting or infection. The plant above is going to be “Manifolded” so it is topped to the third node, rather than the fourth. Topping low, requires removing significant growth. However, if the plant is not topped it will put all of its energy into the one main top. By topping it, I now have two main growth tips! This may make you feel like it is setting you back, however, look at this plant just 6 days later… It is twice the plant it used to be! Hi Dr. Coco, I’m really enjoying all the great articles on this site. My question to you is, what is your thought and or recommendations for topping, or fimming on auto’s specificly Indica’s? Thanks . Ooops! Sorry Dr. Photon, I thought Dr. Coco wrote this article on topping. Thanks. Mike H.
No Worries Mike. We work on the articles together… especially this one. I would say that if the Auto is growing well during the first couple of weeks then I would certainly advise topping it. You have a narrow window of opportunity though, You want to top well before they start flowering to give the plant time to grow out of it. For most auto flowers, I would try to get all the topping done before the end of the third week, but it depends on strain and how well she is growing. Hey mike, no problem. Dr.Coco helps make all my articles better so we share the credit. @Dr. Photon,@Dr. Coco, Thank you very much, (ha, I got two for one) I’m glad to hear that since two main colas are better than one.